I have now had a response to my query to Ipswich Borough Council in regard to why bins are left in just about the worst place they could be for pedestrians by their contractors after they have been emptied. The council confirmed that their contractors are instructed to leave bins “on the curtillage of the property… not obstructing residents’ driveways, preventing usage of drop kerbs etc” which they described as being the ‘safest position‘ as it didn’t risk damage to cars which she considered would be the case if the bins were left in line with the parked cars as I had proposed. Not a single mention of the needs of pedestrians in general and the blind and wheelchair users in particular. Not exactly what seems to be required under the Equalities Act 2010 which came into force in October 2010 and provides ‘A basic framework of protection against direct and indirect discrimination, harassment and victimisation in services and public functions; premises; work; education; associations, and transport‘. As it happened it was bin-day today and also polling day today so I was able to sample a few pavements on the route to my local polling station just after the bins had been collected. 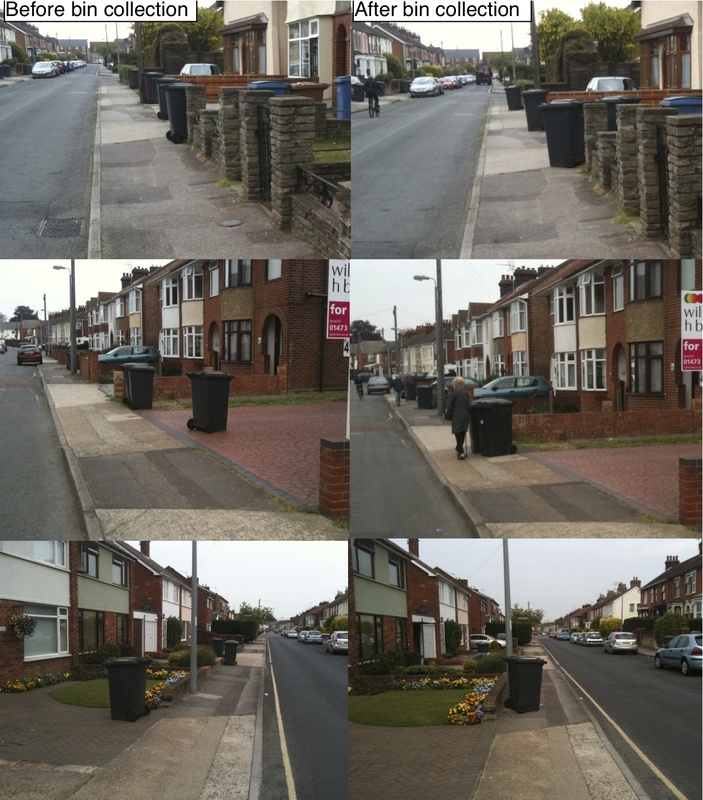 As you can see from the pictures below (on the left ) the bins were generally left in a position where they were obstructing the pavement. I moved them to a more sensible pave where I proposed that they should be left (on the right) which was often on the relevant driveway only a very short distance from where it had been left by the binmen. Update: Since making the above post I have noticed that the contractors leave bins in a much more obstructive way than the householders did. 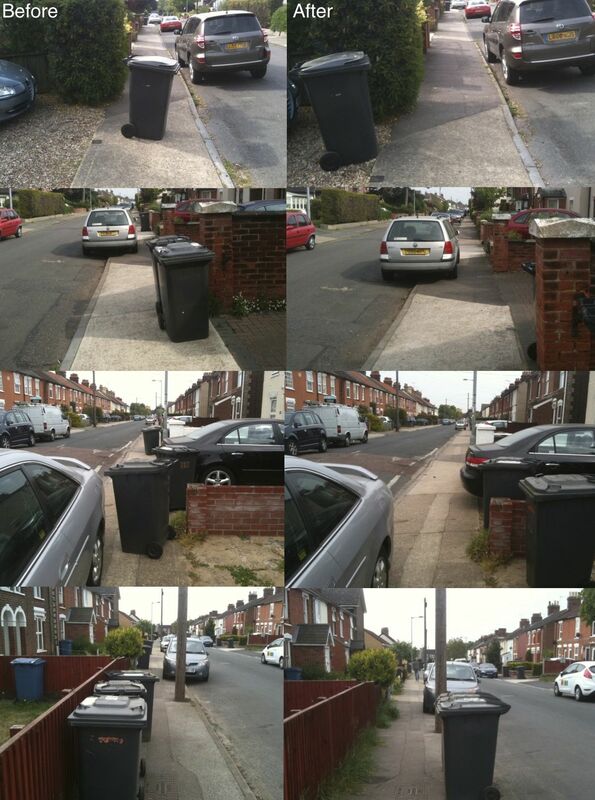 Check out the pictures below – the images on the left were taken just before the bin collection showing that the householders left them on the edge of their property sensibly, the images on the right show how to binmen then left them all over the footway.